"Oh my God! How will my career go in the Year of the Pig?" As we usher in a brand-new year, who wouldn’t want to know about their health, love, or career? The Taipei Mass Rapid Transit Corporation (TRTC) has teamed up with the Longshan Temple in Wanhua District to launch the very first Lucky Trip ticket. On Thursday January 31 at 10:00 am, a special ticket vending machine at Longshan Temple metro station will start selling these Lucky Trip tickets, which come in a limited edition of 5,000 pieces of NT$ 50 each and are limited to 2 tickets per person. These blessing cards double as one-way tokens (round plastic tickets). After using them for a ride, they will be released by the fare gates, so passengers can keep them as mementos. At the time of purchase, the ticket vending machine will display options for fortune-telling poems about health, love, or career for the buyer to choose from. After purchase, the screen will display a printable receipt of the poem and a QR code, which the passenger can scan with their mobile phone to store the poem. In addition, Longshan Temple will hand out 200 lucky charms as gifts to the first 200 ticket buyers. The name of the Lucky Trip tokens refers to the good luck we all wish for in life, and to the metro trips we make to get around the city. Together these words represent good wishes from Taipei Metro to its passengers. 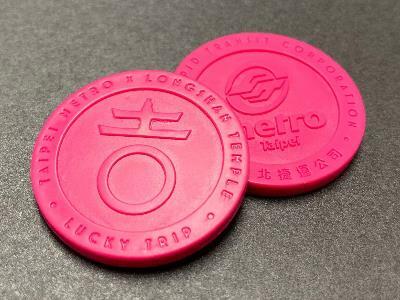 Distinct from the usual blue one-way tickets, the Lucky Trip token comes in lucky pink with the character “吉” (pronunciation: ji; auspiciousness) at the center, composed of traditional design elements such as temple fortune-telling sticks, Fukien-style roof eaves, and swallowtails to add extra lucky flavor to the token. After entry through the fare gate, the token is valid for unlimited travel distance across the MRT system until exit through any fare gate. The fare gate will release the token after it is used, allowing the passenger to keep it as a memento. As a token of the temple’s appreciation for the passengers, a limited number of complimentary red envelopes will be available at the service desk of the Longshan Temple metro station on presentation of the token and purchase receipt. Available while supplies last. For further information about the Lucky Trip ticket or the red envelopes, please talk to the service desk at Longshan Temple metro station, or call TRTC’s 24hr Customer Service Line: (02) 218-12345, the Citizen Hotline: 1999 (02-2720 8889 when calling from outside Taipei), or visit the Taipei Metro website at https://www.metro.taipei/.